We always get the organization bug in January, so I thought you'd like to see Sara Leigh's new organizational scheme. I think it looks fabulous! Wish I was this organized. With Holiday Madness in full force here in Chilly Hollow, I've not been keeping up with the podcasts from Gary and Christine at Fiber Talk. I'm about to remedy that since things are calmer after Christmas. Like the fun bubble designs from A Poore Girl Paints? Here's an interview with Amy Poore. Are you a counted canvas worker? The Fiber Talk team catches up with Orna Willis a second time. Do you love Needlepoint Now magazine? Fiber Talk interviews Elizabeth Bozievich, the editor, a second time. There are bound to be things you've missed. Scroll down a bit until you can see Recent Posts on the left side of the page and pick something that sounds interesting…. © Copyright December 27, 2017 Jane M. Wood. All rights reserved. 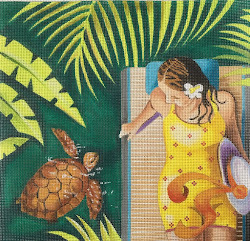 A local online newspaper just profiled Nancy Heinrichs and her stitching. The photos are mostly needlepoint but Nancy does it all. Many thanks to Needlepoint Now for mentioning this on Facebook! © Copyright December 23, 2017 Jane M. Wood. All rights reserved. I will apologize in advance for those who expect a video of Ruth Schmuff dancing. But trust me, this is nearly as good! You will learn how to make a corkscrew stitch and how to make memory thread coils in two separate videos Ruth did for one of her mystery classes, the recently ended "Boo!" If you want to see more of this canvas, click on the tab that says "Bedecked and Beadazzled Mysteries," find David Galchutt's "Boo!" and then click on all the links. 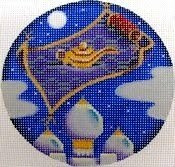 The class itself is available via mail order through Bedecked and Beadazzled, Ruth's shop. Thanks, Ruth! We love learning new things and getting an idea of what you teach in your classes. © Copyright November 13, 2017 Jane M. Wood. All rights reserved. Enriched Stitch shows off the stocking they stitched for a special customer who died before she could work it herself. Almost all Christmas stockings have special stories behind them. It's too bad Mimi never got to finish her story. © Copyright December 18, 2017 Jane M. Wood. All rights reserved. If you want to overpay for a needlepoint gift, 1st Dibs has you covered. To see more of their offerings (and to be far, some of the antique chairs are lovely), use search. It's fun to explore all the offerings, from tennis racket covers to tote bags, pillows and slippers, rugs and furniture. Lycette Designs is like the rest of us, she has a wish list for Christmas Goodies. Machelle Somerville's "Light Candles" which I think would make a magnificent Christmas serving tray. Vicki Sawyer's "Heron Royalty" is gorgeous. This would make a great piece for my husband who adores blue herons. "Chilly Christmas" is a Mary Engelbreit/Painted Pony design that looks a lot like my niece. I just love it! I've always loved Kelly Clark's Halloweenies. Which one to buy? Should it be the mummy? Or The Grimm (page 22 of second link below). And naturally I might need a Dazor…. Have fun assembling your list of goodies for Santa! Since it is Thanksgiving, I thought we might have a little extra time to spend over at Susan Portra's website while everyone else eats themselves silly and watches parades and football games. Just click on the date to see each featured canvas. 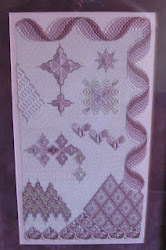 Many have stitch diagrams but they all are full of fabulous ideas! Plaid entirely in beads?! Who'd a thunk it! That Susan is a genius. There are other things to see but nothing beats studying with a master of canvas embellishment. NOTE: I have no idea why this published two weeks after it was suppose to. Mysteries of the Computer strike again! © Copyright September, 2017 Jane M. Wood. All rights reserved. 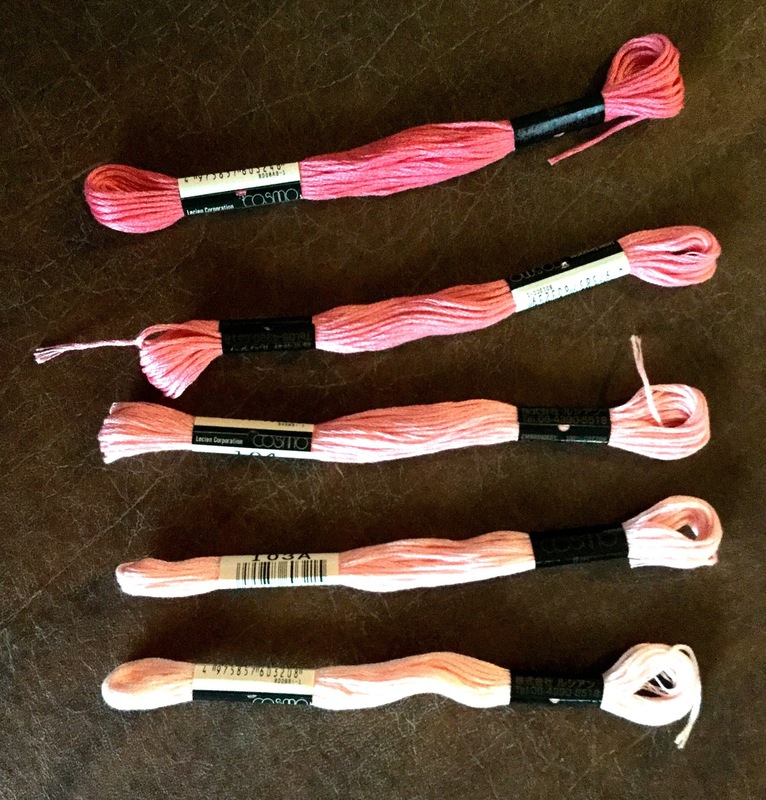 Recently the editor of Needlepoint Now magazine was in Washington State and visited The Needlepointer in their new location. 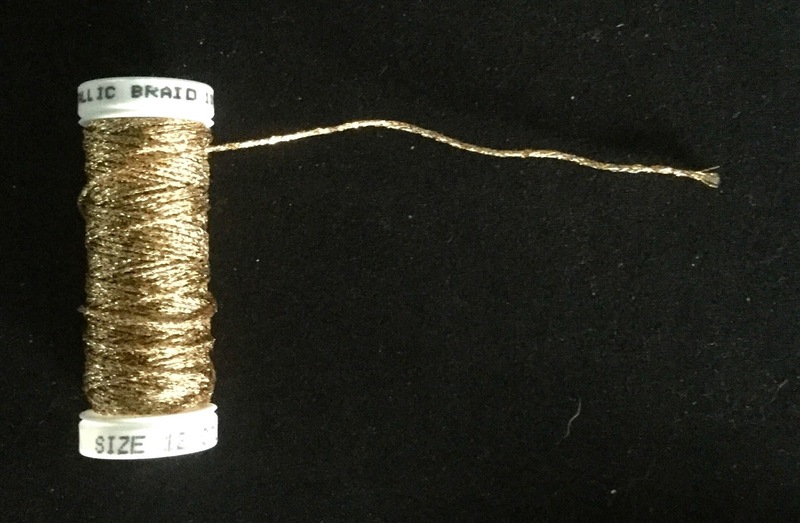 It's a great article about the history of the shop and how they got into selling Straw Silk, plus the shop manager Brian Shaw gives us a great way to judge if we are going to run out of thread for a project. There is a lot more in this issue of the newsletter, but I loved reading about one of my favorite shops. If you are too far away to make a visit in person, you can be like me and browse The Needlepointer's website. I just spotted a very clever background idea on Candace Bahouth's new "Avebury" design for Ehrman Tapestry. Click on the "click here to view larger image" link for a good look. It's two colors in stripes of varying widths and irregular edges in two muted colors. I think this would look fabulous for those pretty florals with the bland, one color backgrounds, sort of like this Point of It All Designs piece. Many thanks to Candace for her clever design work! © Copyright October 24, 2017 Jane M. Wood. All rights reserved. Stitchers Paradise has closed! Rats! They were in the Doral section of Miami and I always planned to visit them when visiting family who live nearly. But I've missed my chance as the owners want to retire and were unable to find a buyer for their business. Their page about frames and stands was one of the best out there for folks who were in the market but didn't have a local shop where they could see them in person. I am grateful that has been available over the years. Many thanks and best wishes for a fun and fulfilling retirement! © Copyright December 6, 2017 Jane M. Wood. All rights reserved. "The Many Paths Up the Needlepointing Mountain"
I've seen a lot of online shop profiles over the years but none as well written as this one. 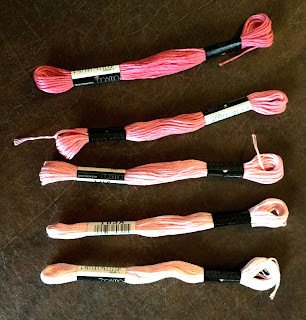 The author profiles a group of Louisiana needlepoint shops beautifully and gives a little flavor of what needlepoint is today. Kudos to Country Roads Magazine and to the author, Lorin Gaudin. 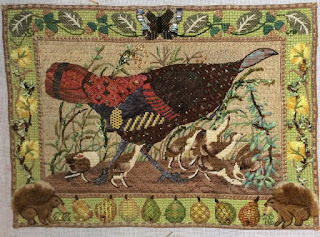 Mary Corbet talks about the Shenandoah Valley Tapestry in this very interesting blog posting. I am embarrassed to say this is the first I've heard of this project, and I live in the Shenandoah Valley!